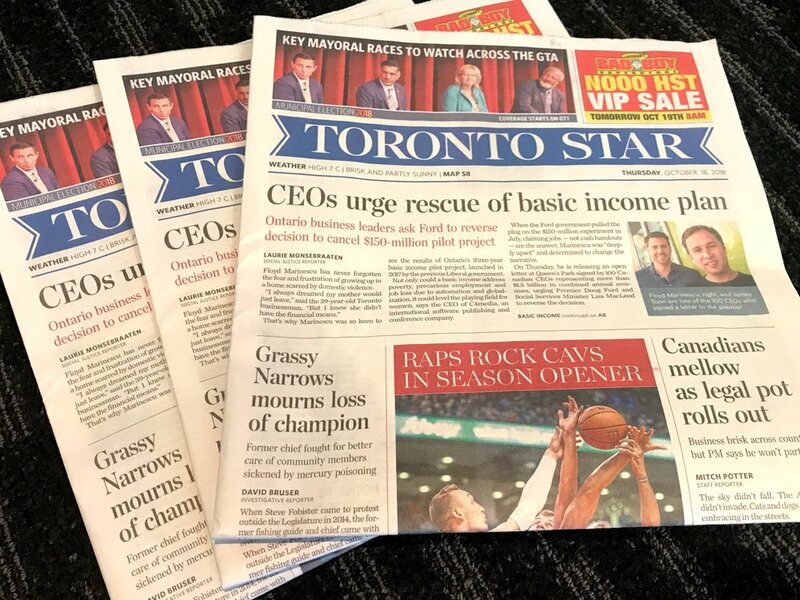 100 Canadian CEO's urge the Ford government not to cancel the Ontario Basic Income Trial. As Canadian business leaders, we urge the Ontario government to continue the Ontario basic income pilot. We see a guaranteed basic income as a business-friendly approach to address the increasing financial precarity of our citizens and revitalize the economy. We don't need to wait to see if advances in automation eliminate many existing jobs; we can already see how decades of automation and globalization have affected the economy. 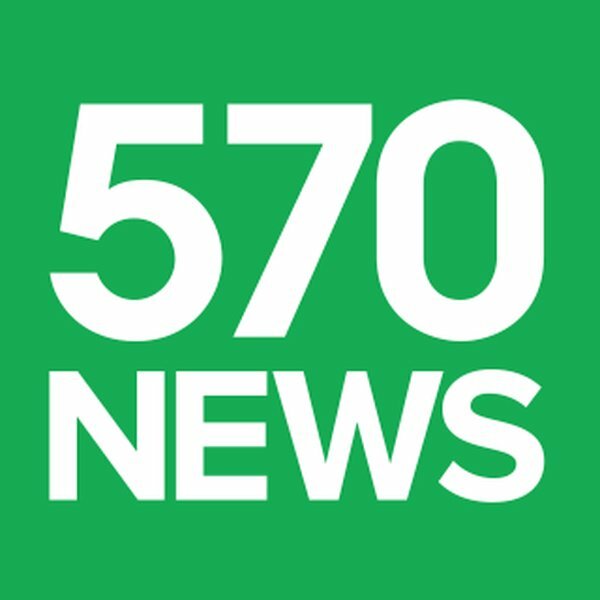 Despite unemployment in Canada at its lowest rate since 1976,9 the share of low-income jobs is increasing: nearly doubling to 30% of Ontarians since 2001, with the percent of Canadians in minimum wage jobs increasing five fold since 1997.10 Over half of Canadians do not have access to $200 in case of an emergency,11 with similar numbers in the US.12 Most Canadians who are in poverty are already working13 (again a global trend14). This is why two thirds of the recipients in the Ontario basic income pilot were working,15 including self-employed and small business owners.16 These are hard working people and critically, these are your voters. Businesses create jobs in anticipation of growing consumer demand and purchasing power. There are over 36M Canadians. If we want to optimize our economic growth we could ensure all 36M are included in that growth and can participate in the economy without precarity. Being unable to escape poverty even while working is not only inhumane: it's also a huge opportunity cost for Ontario and Canada's businesses. As for objections around cost, several funding models are available. For instance, a three percent increase in GST federally has been projected as the net cost to pay for a basic income, and that sounds like a good deal to us.22 A three percent increase in GST could be the backbone of a major economic stimulus while simultaneously ending poverty. Debates around basic income seem to center around ideological approaches to welfare reform. We believe in the potential for basic income to replace inefficient welfare programs, encourage work, and eliminate the welfare trap. We believe it is better that people decide how to spend their assistance rather than government bureaucrats, which is why basic income is pro-free market. 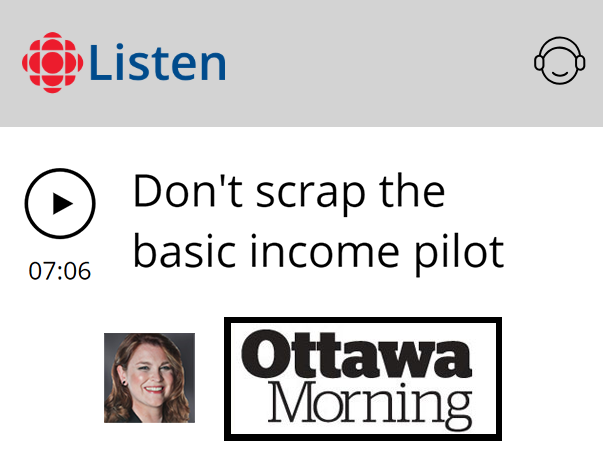 If the Ford government truly believes that basic income will discourage work, then you should allow the pilot program to continue so can have data on your side. If however it encourages work, then this idea is one that all parties can build off. We have no partiality to the scheme designed by the previous Ontario government, but we do feel it is good enough to test the main theses of basic income. While other governments all over the world are beginning to design their own programs, ours is already running, making Ontario a world leader. The results of this experiment once complete will inform policy decisions all over the world. As business leaders, we urge you to reverse this decision to cancel the basic income pilot program. Co-Authored: Floyd Marinescu CEO of C4Media Inc., and Paul Vallée CEO of Pythian Inc. Signed: 100 Canadian CEOs, Private Business Owners, Presidents and Cofounders. Jesson + Company Communications Inc.
Over the last 20 years, real earnings for the bottom 50 percent of Canadians has actually declined. Share of national income has also declined by almost 30%.